In recent years the image of golf has been undergoing something of a renaissance. Swathes of young new players have emerged on the professional tours, equipment technology has undergone a veritable boom and digital media channels have modernised, refreshed and brought the game to a new, younger audience. Golf clothing has taken similar strides forward, with the baggy cotton-based chinos and polo shirts of the 1990s replaced with much more technical, high performance apparel. 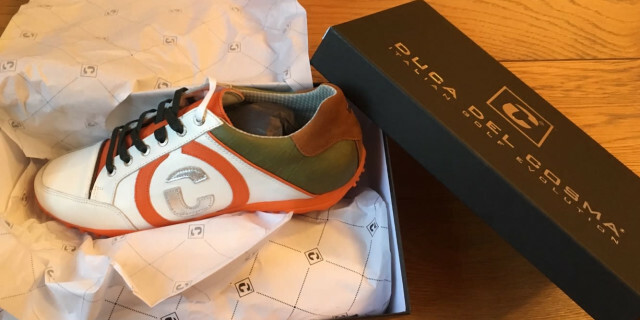 Enter Duca Del Cosma; an Italian brand aiming to bring “stylish, bold, classy, elegant and sporty” clothing to male and female golfers. Founded in 2004, the team set their sights on being a catalyst within golf’s revolution, bringing Italian style and flair to the masses. We tested the Eton White which is made from fine Nappa leather, features a memory foam insole and Duca Del Cosma’s Airplay III outer sole. The rubber construction of the sole has a stabilising tread with extra heel support to ensure good grip. The shoes are waterproof, stylish and extremely well made. It is no surprise to learn these shoes are Italian by design. Classy with a hint of flair for good measure, they exude passion and confidence without being imposing. The colour scheme works very well, with lots of nice detailing and diverse enough to complement any outfit. The shoes were also supplied with two different colours of laces to allow an element of personalisation depending on user preference. The hallmarks of Italian design shine through in the quality leather the shoes are made from. Supple and luxurious to touch; they are as comfortable to wear as trainers. The laces feature a wax like finish which is a tactile, satisfying material to touch. Lightweight by construction, the Eton White is breathable, helping to ensure our feet remained at a comfortable temperature. 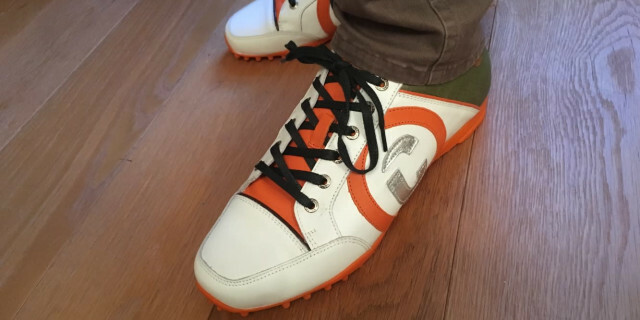 One of the biggest benefits is how easily the shoe transitions to non-golf activities; meaning you can step off the course and carry on with your day in comfortable and stylish footwear. The rubber sole uses “cone-shaped nubs” to give golfers stability and traction on the course. We put the shoes to test over the course of a week on the range (1 hour lesson), at the course (45 holes in 24 hours), in the bar (1 pint and 1 very tasty burger) and even whilst driving; they felt fantastic throughout! Fresh on they felt like slippers and despite quite high usage over a short period of time, we had no hot spots or areas of discomfort whatsoever; demonstrating the quality of the materials used. Balance in the swing is an issue which I personally grapple with due to an old ear injury, so maintaining good grip is something I demand as a necessity from any new pair of shoes. The Eton White was exceptional in this department, offering superb contact with the ground across a range of surfaces and gradients. Much to my playing partner’s amusement, the shoes received abnormally vigorous testing in bunkers; including six successive holes on the front nine! 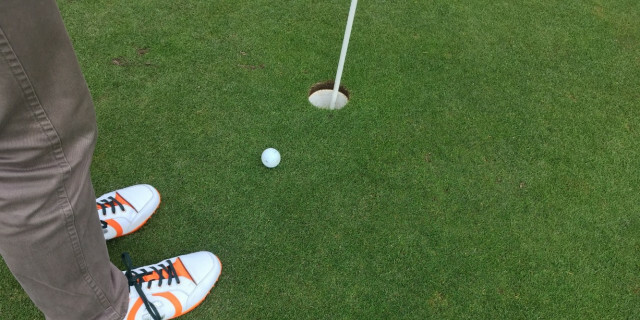 Despite this exorbitant exposure, there wasn’t a single grain of sand in the shoes at the end of the round, demonstrating well designed closure. A fair score of 19 stableford points for those first nine holes confirms the shoes provide good support whilst scrambling! This is a stylish, well made and luxurious shoe designed for a new generation of golfer. Performance on the course was exemplary from the very first hole, with an extremely comfortable fit and excellent grip on all surfaces. The Eton White was equally at home off the course where we wore it for an entire day whilst driving/eating out etc. These shoes offer the modern golfer a fashionable shoe which performs well on the course and transitions seamlessly to non-golf activities. Would I buy a pair having tested them for a week… I wouldn’t hesitate for a moment mio amico!